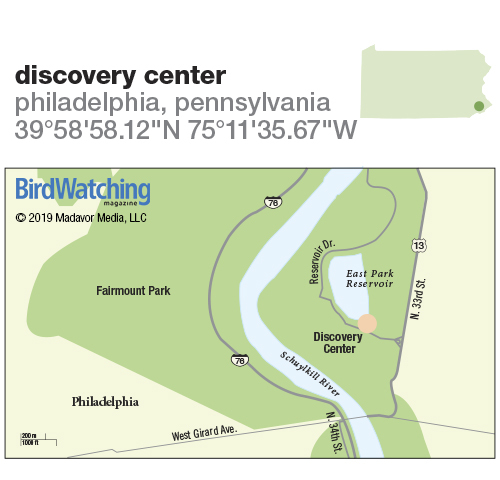 A site within Fairmount Park where you can find warblers, vireos, orioles, Osprey, herons, and other birds. Philadelphia’s Fairmount Park is one of the largest urban parks in the world, covering 9,600 acres with miles of woodland and riparian trails. But one pocket of the park was closed to the public for 50 years — during which it became a pristine habitat and stopover for more than 170 species of birds. The opening of the site as the Discovery Center last September, a collaboration of Audubon Pennsylvania and Outward Bound, is cause for celebration for every area birder. The adjacent lake is the largest open body of freshwater in the city, and the birds appreciate it. Canvasbacks, coots, and mergansers plunge in for food. Great Blue Herons and Belted Kingfishers hunt along the shorelines. Geese, loons, and gulls bob on the waters. Migrant warblers, vireos, flycatchers, and wrens find rest in the urban forest. The three-quarter-mile trail around the lake is an easy walk on mostly level ground, and I enjoy the views of the city skyline looking southeast, over the water. I also love the climb up the wooden, four-story observation tower, which was built to slightly sway — like a treetop. From there you can scan for the city’s familiar raptors: Red-tailed Hawks, Peregrine Falcons that nest on City Hall, and of course the occasional Philadelphia eagle. The Discovery Center is adjacent to a 37-acre naturalized lake. From I-76 west, take exit 342 to merge onto US 13/US 30/N. 34th St. toward Girard Ave. Turn right on W. Girard Ave., and then left onto US 13 North. Turn left on Reservoir Dr. The parking lot entrance is just beyond the Discovery Center building. Deciduous forest, shorelines, and wetlands. A three-quarter-mile natural trail circles most of the lake. Easy to moderate in difficulty. 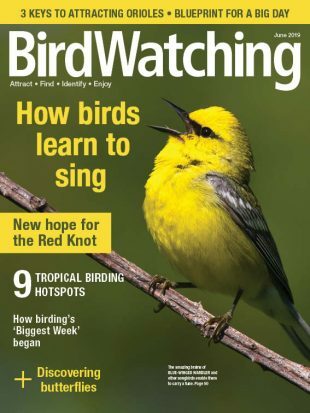 Spring: Wide variety of warblers, including Blue-winged, Black-and-white, Prothonotary, Tennessee, Nashville, Connecticut, Mourning, Hooded, Cape May, Cerulean, Blackburnian, and Black-throated Green. Also, vireos, orioles, thrushes, and other migrants. Summer: Breeding songbirds include Warbling Vireo, Blue-gray Gnatcatcher, Yellow Warbler, and Baltimore Oriole. Also, Bald Eagle, Osprey, Green Heron, and Common Nighthawk. Fall: Palm Warbler, Eastern Phoebe, Cedar Waxwing, and other migrants. Winter: Canvasback, mergansers, and other diving ducks. Loons and grebes visit in late February to late March. Rarities: Long-tailed Duck, Red-throated Loon, Red-necked Grebe, Dovekie, and Nelson’s Sparrow. Year-round. Best time to visit is morning. Interpretive exhibits and Audubon programs designed for all ages. Restrooms in the main building. Jointly operated nature center and city park. Open May 1 to October 31, 10-4 Wednesday to Sunday, closed Monday and Tuesday. Open November 1 to April 30, 10-4 Thursday to Saturday, closed Sunday to Wednesday. Admission and parking free. Bring a spotting scope for viewing the lake’s far side along the trail. About 11 miles south of Discovery Center. 10 miles of trails and a boardwalk through the wetlands. Least Bittern, Marsh Wren, Wood Duck. About 6 miles south of Discovery Center. Covers 45 acres of woodlands along the Schuylkill River. 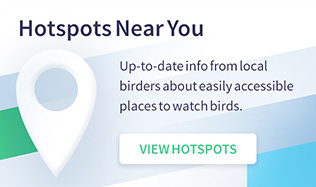 Good birding during spring and fall migration. Alan Jaffe is a former editor at the Philadelphia Inquirer and a nature writer for BillyPenn.com.